Rights group says ‘all aspects of American life are compromised’ due to lack of proper gun regulation. 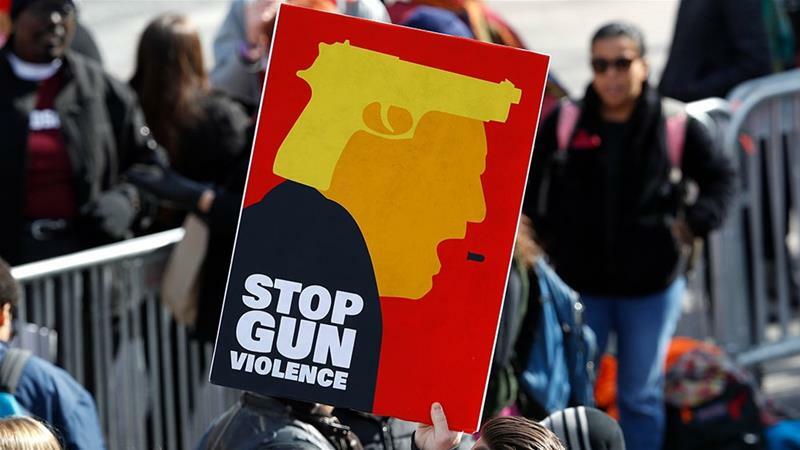 Gun violence in the United States has become a human rights crisis, Amnesty International said in a new report that points the finger at the US government. According to the international human rights organisation, an average of 106 individuals died a day from firearm-related incidents in 2016. Of the 38,658 firearm-related deaths that year, nearly 23,000 were suicides and more than 14,400 were homicides, Amnesty said. There were another 1,305 deaths that were unintentional, undetermined or from legal interventions. The report noted that more than 116,000 people suffered from non-fatal firearm injuries. “For many gunshot survivors, the mental, physical, emotional, familial and financial consequences of their injuries shape their lives irrevocably,” the report said, adding that the toll gun violence has is a “public health crisis of astonishing proportion – with remarkably little government response”. Calls for stricter gun control were again amplified this year after mass shootings in Maryland, Texas and Florida, among other places. Seventeen people – the majority of whom were students – were killed when 19-year-old Nikolas Cruz opened fire on Marjory Stoneman Douglas High School in Parkland, Florida in February. Ten people were killed just three months later when a teenager opened fire at Santa Fe High School outside Houston, Texas. Since the shootings, students have held marches and rallies throughout the US to call for stricter gun control. Last year, the US witnessed the deadliest mass shooting in the country’s modern history after 58 people were killed at a music concert in Las Vegas, Nevada. 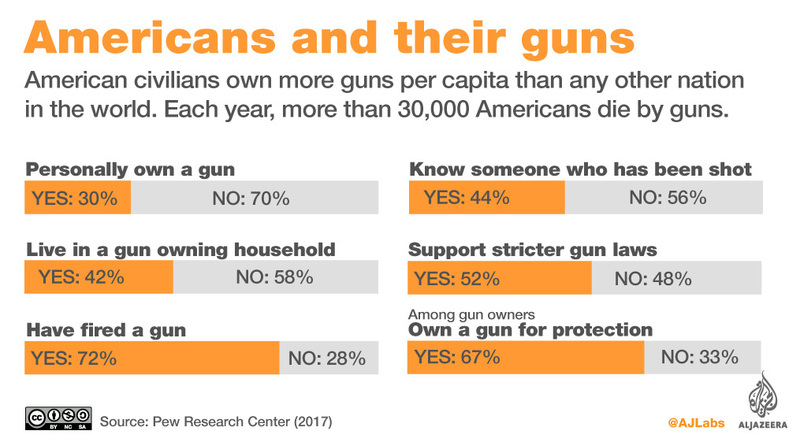 Although the report noted the “profound emotional and psychological effect on survivors, families and communities” public mass shootings have, it said they accounted for less than one percent of the gun deaths in the US. Amnesty’s report instead focused much of its attention on other types of violence, including urban gun violence and domestic violence, as well as how gun violence affects children. The report noted that gun violence disproportionately affects urban communities of colour, particularly young black men. According to Amnesty, black men aged 15-34 were almost 20 times more likely to die from firearm homicide than a white male in the same age group. 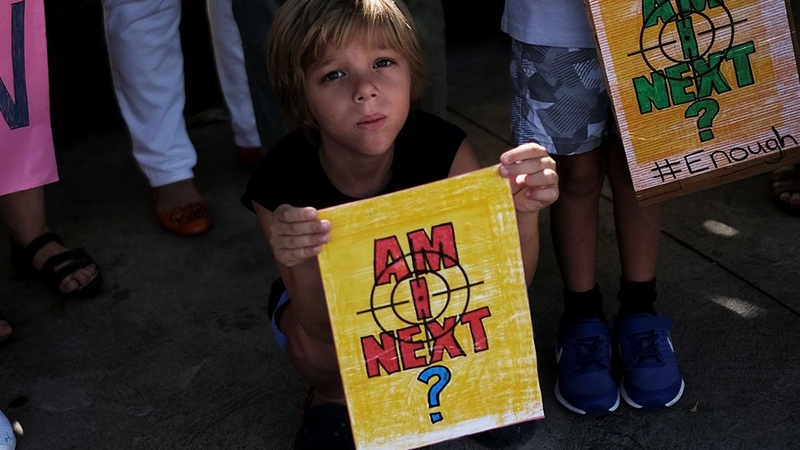 “The causes of gun violence in communities of colour are multi-faceted and there are deep-seated issues around poverty, discrimination and economic, social and cultural rights,” Amnesty said, noting such issues were beyond the scope of the report. The report told the story of a Shirley Chambers, who lost all four of her children to gun violence in separate incidents in Chicago. The report made several key recommendations to address gun violence and protect human rights. “Despite the huge number of guns in circulation and the sheer numbers of people killed by guns each year, there is a shocking lack of federal regulations that could save thousands,” Margaret Huang, executive director of Amnesty International USA, said in a statement. According to Amnesty, although more than 100 pieces of legislation relating to gun violence have been introduced since a shooting at Sandy Hook Elementary School left 26 people, including 20 school children, dead in 2012, no “meaningful” federal law regulating firearms has been passed. It noted that some laws have been passed at the state level, however, including the banning of bump stocks – a modification that increases the rate of fire for semi-automatic rifles – in eight states and laws aimed at improving background checks. The Department of Justice has also submitted a regulation that would ban bump stocks nation-wide. Among its recommendations, Amnesty called on the federal government to pass legislation requiring background checks on all firearm purchases and transfers, ensuring records are reported accurately and setting a number of minimum conditions that should be met before one is allowed to buy a firearm. Last month, a US federal judge extended a ban on the online distribution of 3D-printed gun blueprints, blocking a settlement between the Trump administration and Defense Distributed, a group that argues access to online blueprints is guaranteed under the US Constitution. Amnesty’s report also comes as the US Senate Judiciary Committee is set to vote on the Supreme Court nomination of Brett Kavanaugh, who has been endorsed by the NRA and who gun control advocates fear could tip the balance in favour of gun owners and manufacturers. Critical Thinking: Do Some People See The President/Prime Minister As Some Kind Of Parental Figure?